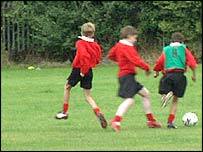 Improving school grounds and protecting playing fields reduces bad behaviour among pupils, says a survey. According to a survey of 700 schools in England which have upgraded their grounds, 73% reported "significant improvements in behaviour" and 64% said that a greener environment meant less bullying. The survey, carried out for educational charity Learning Through Landscapes, also showed that 65% of schools said better school grounds had improved the "attitude to learning" among pupils. But too many schools still fail to invest in their grounds, says the charity's chief executive, Ken Davies. And there have been repeated concerns about the sales of playing fields and sports pitches. When there are so many worries about children's lack of fitness, he says that it is even more important to have access to open spaces and places to play. But schools don't need to be set in rolling acres of green fields to be able to create a more creative and healthier environment. The Spa School, a special secondary school for pupils with autism, occupies an old-fashioned red-brick building in Bermondsey, in the inner-London borough of Southwark. And from the outside there is nothing to suggest the greenery hidden away in the relatively small area behind the school. 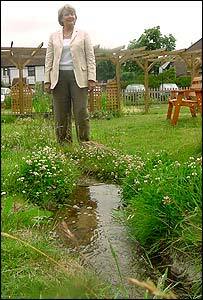 Instead of the harshness of tarmac and chain fencing that you see in so many schools, there is a landscaped garden, with flowers, vegetables and an artificial stream running through. As part of a history project, there is a separate area for a Victorian garden, where pupils have researched the type of vegetables that would have been grown and the patterns in which flowers would have been presented. 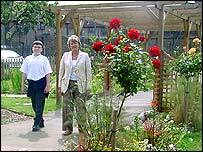 Head teacher, Jude Ragan, says that the garden has a direct influence on the mood and behaviour of her pupils, helping to soothe youngsters who can be anxious and confused. Autistic pupils can have a deep sense of isolation, and working together in the garden can help to build links with other pupils and develop insights into the natural world around them. "Our pupils can live a life filled with anxiety, the garden can be one of the few chances they have to sit somewhere relaxing. It's a wonderful asset," says the head teacher. 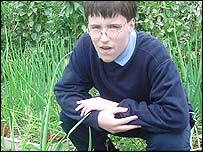 Harry, a young teenager at the school, says that he likes to feel calm on a bench in the garden and listen to the sound of the running water, which he says is "like in a forest". The head teacher says that last week, Harry brought her a bunch of organic carrots, freshly-dug from the vegetable patch, where they also have onions, peas and potato plants. 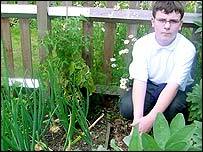 Russell, another pupil in his class, gives a guided tour of the vegetables and says he likes the sense of peace. Both pupils are visibly proud of the garden, which the pupils help to design and maintain - and Harry describes this patch of green as "the best garden ever, bar none". 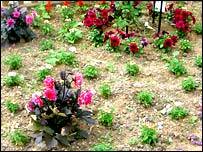 And even when pupils get angry and have tantrums, Jude Ragan says that they never damage the garden, which has remained untouched by any vandalism. Since the school is only a few streets away from the traffic-filled Old Kent Road, it shows what a few well-positioned plantings and an imaginative use of space can achieve. From next year, there will be a teacher who will have full-time responsibility for the grounds, and the garden will be incorporated into every subject taught at the school. And a greenhouse is to be introduced which will be part of an enterprise project, growing and selling produce, to give pupils experience of running a business. The impact of the garden is felt in the school in many ways, says Jude Ragan. Improving the quality of the grounds changes the way children play, engaging pupils' interest and helping to set a more relaxed tone. Creating a less aggressive, more healthy environment also helps to make pupils more ready to study when they go back into the classroom - and it reduces the kind of tensions that lead to name-calling and arguments. But the head teacher says that schools are faced with tough decisions over how they spend their budgets - and school grounds can lose priority. At the Spa School, they have received lottery and other extra funding to support the re-development of the gardens, as the greenhouse project alone will cost £30,000. But she says that she empathises with heads who do not have the cash to invest in their play areas. And she contrasts the greenery of her current school with a previous experience, where every Monday morning she was faced with windows smashed by vandals. Ken Davies, of Learning Through Landscapes, says that survey results - and examples such as the Spa School - show how much can be gained by improving the environment in which children learn. He says that the government is successfully preventing the sell-off of playing fields - but the bigger issue now is the way that so much school land is under-used. Financial pressures have meant that for too long schools have made few investments in their grounds - and that a valuable resource, which could be used for sport, play or learning has been neglected. Learning Through Landscapes claims that only 30% of the potential of England's school grounds is being used, with grounds either little used, badly managed or untended. "There is a very strong case for a significant investment in school grounds. As our survey has shown, the benefits ripple out far beyond the school gate," he says.